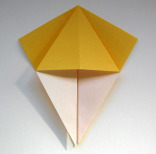 This origami lily is our adaptation of one in Origami by Toyoaki Kawai. We chose this version because it has six petals, like real lilies. 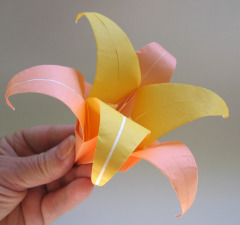 The version in Origami calls for folding two three-petaled origami lilies and then refolding them together. 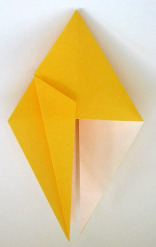 The pink lily below is an example using the refolding process. Take a look at pictures of real lilies and you'll notice the petals overlap. Our simpler version achieves the overlap and avoids the tricky re-folding process of the original design. You can make either style from our instructions. This lily is not recommended as a first project. But if you are comfortable making a crane, go for it! 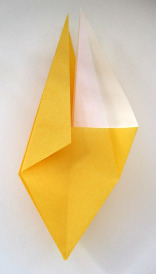 < Consider making an origami lily plant. Make white lilies and you have an Easter lily. Buy now or read more about the Sputnik. 2 sheets of perfectly square paper. You will need to cut two equilateral triangles as explained below. 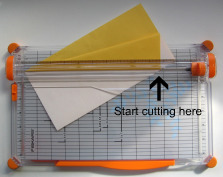 We recommend use of a paper trimmer as described in our cutting tips. Task 1: Cut an equilateral triangle. Crimp one of the short sides to mark the middle of the side. The pencil line indicates where you are going to fold (you don't need to draw it). 2. Fold the top layer along the line, but adjust the left corner so that it meets the top edge ... (The fold won't be exactly in the middle of the side.) ...and ends exactly at the corner on the right. Tip: Use a straight to make a preliminary crease. 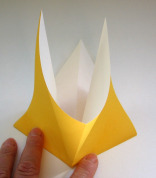 Make this fold as accurately as possible. Adjust and refold as necessary. This avoids the possibility of crunching the corner. 4. Open the white piece to reveal your perfect equilateral triangle! 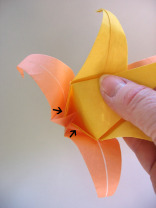 Task 2: Fold a three-petal lily. 5. You already have one crease running from a point to the opposite side. 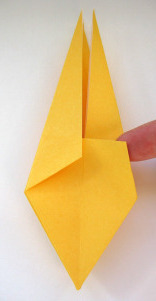 Make two more creases like it by folding the paper in half two more times. Important: Strive for perfection in folding the two other corners in half! These will be the tips of your petals. 6. 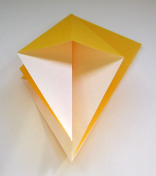 Place the paper colored side down (if any). 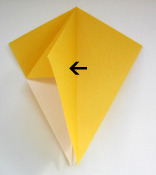 You are going to fold the lower half up on the creases indicated by the arrows. 7. Fold the lower half up, bringing all three tips together. Do not make any new creases. Some folds will simply reverse in direction. 8. Spin the model around and squash-fold a triangle. 9. 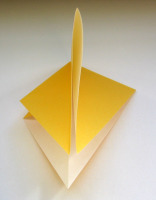 Page-turn the flaps and squash-fold the two remaining large flaps. 10. 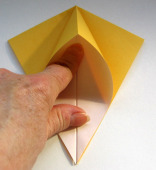 Fold the edge to the center line. Repeat on the five other edges. 11. Spin the model around and unfold one of the sides. 12. Starting at the tip, as indicated by the arrow, refold the side. Slide your finger down, reverse-folding as you reach the bottom. Simply allow the model to collapse on the existing creases. Do not make any new creases. Repeat on the other five sides. 13. Page-fold so you have a solid side like this. 14. Fold the short sides to the center line. Repeat Step 13 and this step two more times. 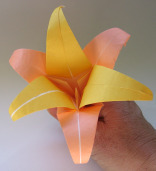 Tip: We like gluing down these flaps on the outer lily. Be sure to only glue these down on the outer one! 15. 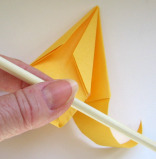 Curl the petals using a pencil, pen, or dowel. We like using a chopstick. 16. Make the second three-petal lily. ...or, don't unfold; simply insert one into the other. The arrows indicate how the flaps of the inner one lock around the v-shaped fold of the outer one. We put a drop of glue on the tip of the inner (yellow) one. Whichever version, you made... Congratulations! 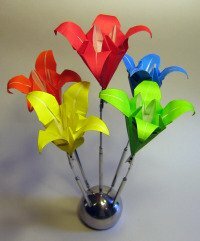 Go to the Origami Lily Plant instructions.